The unique properties of hexaboride crystals provide stable electron-emitting media with work functions near 2.65 eV. The low work function yields higher currents at lower cathode temperatures than tungsten, which means greater brightness (or current at the beam focus) and longer cathode life. Typically, these cathodes exhibit 10 times the brightness and more than 10 times the service life of tungsten cathodes. In electron microscope applications, these characteristics translate to more beam current in a smaller spot at the sample, improved resolution, and less frequent cathode replacement. For applications with large beam spot sizes, where large total current and current density are required, large, flat crystal faces of LaB6 or CeB6 can be the cathodes of choice. This regime is unsuitable for point sources such as field emitters, which are unable to provide sufficient total current, and has been thought of as the realm of the dispenser cathode. However, LaB6 and CeB6 may be more suitable, being particularly robust and resistant to chemical poisoning. They have modest vacuum requirements and long shelf life, and need only be brought up to operating temperature to provide emission, eliminating the activation procedure required of dispenser cathodes. They can provide long-term, stable operation at current densities up to 50 A/cm2, and may be fabricated in a variety of shapes and with many different heating and mounting configurations. LaB6 and CeB6 are the materials of choice for high current cathodes in a variety of advanced and custom applications. The performance and lifetime of the hexaboride cathode are determined by several factors: vacuum level, cathode temperature, impurity level, crystal orientation, tip shape, and mount design. Vacuum requirements are more stringent for hexaboride emitters than for tungsten in order to minimize carbon contamination. In laboratory tests, CeB6 has proven to be more resistant to the negative impact of carbon contamination than LaB6, which gives it an edge in potential cathode lifetime. Excessive operating temperatures accelerate evaporation, thus decreasing the life of the cathode. Care must be taken to properly optimize cathode temperature to obtain the required emission without overheating the crystal. CeB6 has another advantage over LaB6 relating to lifetime: its evaporation rate at normal operating temperatures near 1800 K is lower than that of LaB6 . So long as care is taken to operate the cathode below 1850 K, CeB6 should maintain an optimum tip shape longer, and therefore last longer. Hexaboride crystals are grown and purified in an inert gas atmosphere to specified crystal orientations. Impurities in the crystal will reduce both brightness and lifetime of the emitter because impurities increase both work function and volatility. We grow and fabricate our own high quality, single-crystal materials using a well-defined process called Inert Gas Arc Float Zone Refining.' An electric arc melts a pressed-powder stick of LaB6 or CeB6 in a controlled atmosphere of inert gas, allowing the liquid-phase zone to freeze onto a selected-orientation seed crystal as the arc is moved along the stick. The finished crystal assumes the desired orientation of the seed with less than 30 parts per million by weight metal impurities. Correct melt zone temperature and process speed minimize excessive boron evaporation to achieve the optimum ratio of metal to boron atoms in the grown crystal. Crystal orientation can be selected to match the cathode design or application. For electron microscopy, the <100> orientation is most desirable due to its brightness and crystal plane symmetry about the optical axis. As the cathode ages, the plane symmetry ensures an even evaporation rate relative to the axis, maintaining a centered, flat emitting surface (See figure). Also, the emission patterns from the symmetric crystal planes will remain consistent as they become more exposed by evaporation, contributing to a brighter beam spot. 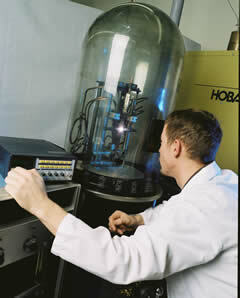 The "tophat" design cathode provides a large-area crystal face electron source for maximum total current. The design of the cathode tip is critical for maximum lifetime and optimum performance. Tip design must also match the specific application's requirements for beam current, spot size, and brightness. For electron microscopy, a conical tip with a flat emitting surface at the apex has proven to be the optimum design. With the flat-tipped cone design, changes in both cone angle and flat diameter affect emission characteristics. In general, the small cone angle (60°) results in higher brightness, but a larger angle (90°) provides longer life and easier alignment. Small flat diameters also result in higher brightness plus a smaller source size, but larger flats provide longer lifetimes and more beam current. These trends allow us to tailor our cathodes to the requirements of practically all thermionic cathode applications. For example, SEM and most transmission electron microscope (TEM) applications are best served by a 90° cone angle and a 16 mm flat tip. This combination provides high brightness, a moderate source size, and very good lifetime. High resolution TEMs require a 60° cone and a 5 mm flat tip for very high brightness and a small source size. In applications requiring high total current in a large beam spot, a <310> oriented crystal in a "top hat" configuration may be preferred, providing a slightly lower work function and large emitting surface. We excel at developing specialized cathodes for custom applications and research purposes. Contact us for your custom cathode needs. The cathode's mount design has a significant impact on performance. The design must be simple, durable and precise. 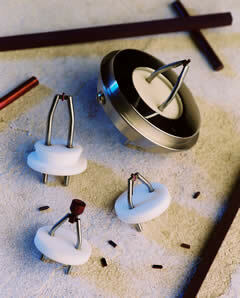 It must resist any movement of the crystal, despite the high operating temperatures, yet be easy to install and align. We feel we employ the best mount design in the industry, the Mini Vogel Mount. In 1988, FEI of Hillsboro, Oregon introduced the Mini Vogel Mount (MVM) to provide the benefits of the original Vogel mount in a smaller, simpler, and more elegant design. Twin posts are rigidly fixed in a thick ceramic base, and bent towards the center in an inverted "V". The posts are made of a molybdenum-rhenium alloy that maintains a high modulus of elasticity even at high temperatures. The posts are spread slightly during assembly to allow placement of small pyrolytic graphite blocks between the crystal and posts. The blocks act as resistive heaters, and help thermally isolate the hot crystal from the highly conductive posts. When the compressive force of the posts is released, the crystal is held with strength and precision. The clamping force of the posts will remain near 5,000 psi for the life of the cathode. The structure of the MVM is amazingly robust, sustaining reasonable impact without deviating from structural specifications. Because the graphite pads shield evaporation of the crystal in the direction of the clamping force, the emitter crystal can be fully utilized without degradation of the mount. Structural failure of the MVM is not a concern when the cathode is operated within the correct temperature and pressure range. Typically, the beam stability of the Mini Vogel Mount cathode exceeds the specifications of the system in which it runs.